David Hertz and Laura Doss-Hertz are big winners. 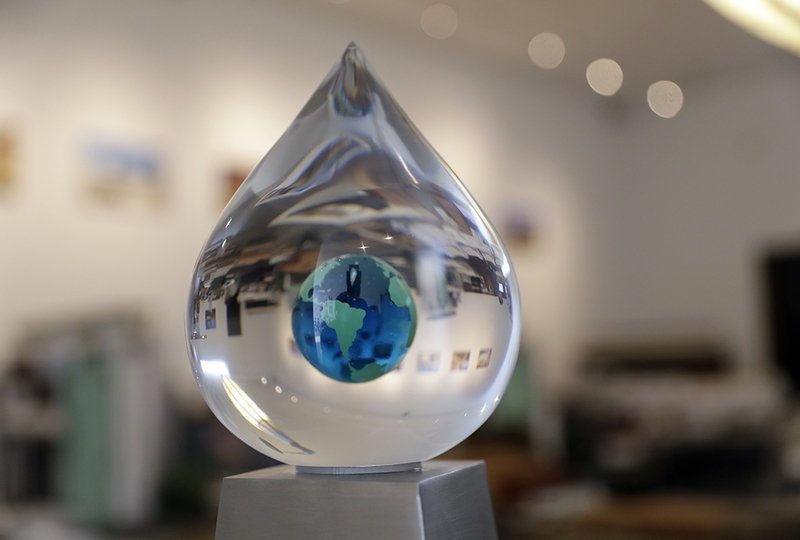 The couple won a $1.5 million XPrize for their water collection invention. David had learned that under the right conditions, it was possible to collect water directly from the air. He set up a modest little contraption on the roof of his office building. Almost right away, it began cranking out bottles of water. So he and Laura thought bigger. They developed a system using shipping containers and wood chips or other organic debris. 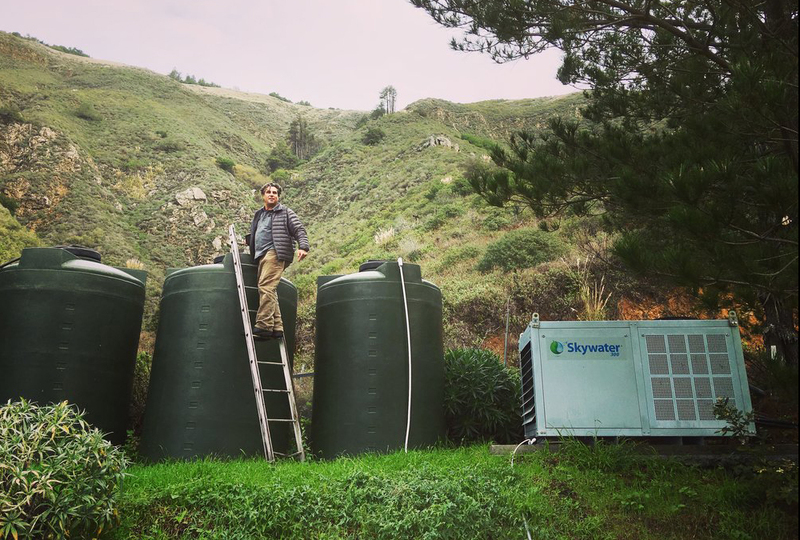 The bigger, better system produces up to 528 gallons of water daily at less than two cents per quart. Then Hertz learned that an XPrize award would be offered for a cheap, innovative way to produce clean freshwater. He was all in. The XPrize competition was created by a group of philanthropists, entrepreneurs, and others. It has awarded more than $140 million over the years for what it calls audacious, futuristic ideas that protect and improve planet Earth. The first XPrize given went to Microsoft co-founder Paul Allen and aviation pioneer Burt Rutan in 2004. They won for SpaceShipOne, the first privately financed manned space flight. When Hertz got started, his little rooftop water-making machine cranked out about 150 gallons per day. He gave it away to homeless people living near his Studio of Environmental Architecture in Venice Beach, California. Then he, Laura, and partner Richard Groden—who worked on that first machine—formed The Skysource/Skywater Alliance. 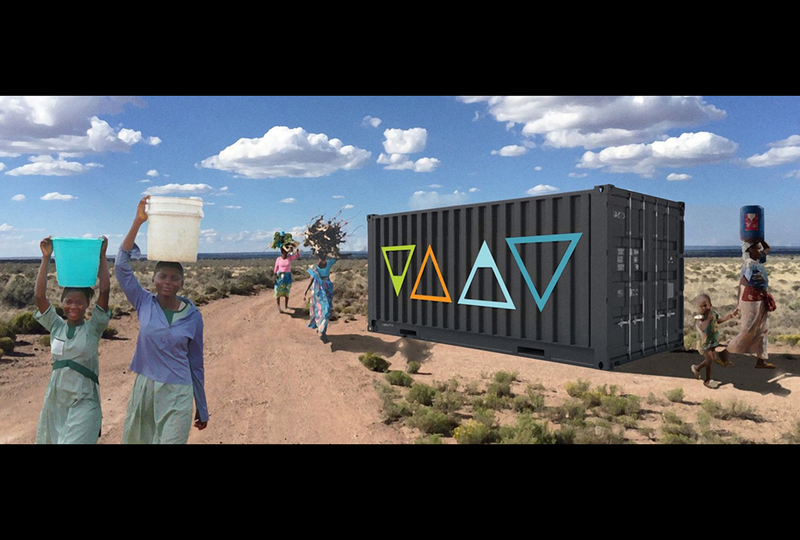 Their new system heats wood chips to produce the temperature and humidity needed to create little rainstorms inside shipping containers. Shipping containers are abundant, Hertz says. And if there are no wood chips to be found, coconut husks, rice, walnut shells, or even grass clippings will work. Stuber envisions the water-making machine as a quick solution for shortages due to natural disasters, drought, or contamination of natural waterways or reservoirs. The XPrize competition drew 98 teams from 27 countries. The Skysource team made it into the top five only after another dropped out. But with their surprise victory, the water-makers are now in for the long haul. 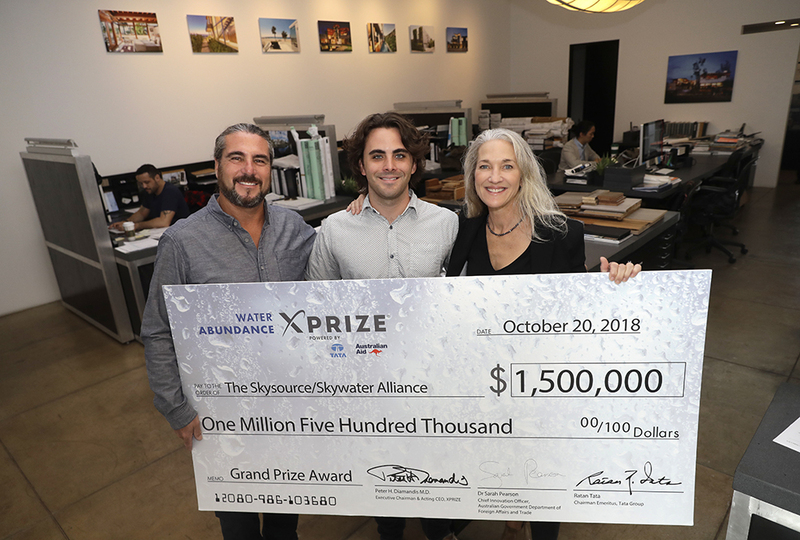 XPrize winners are not required to use the prize money for further development of the winning idea—but David and Laura agreed that’s what they would do. 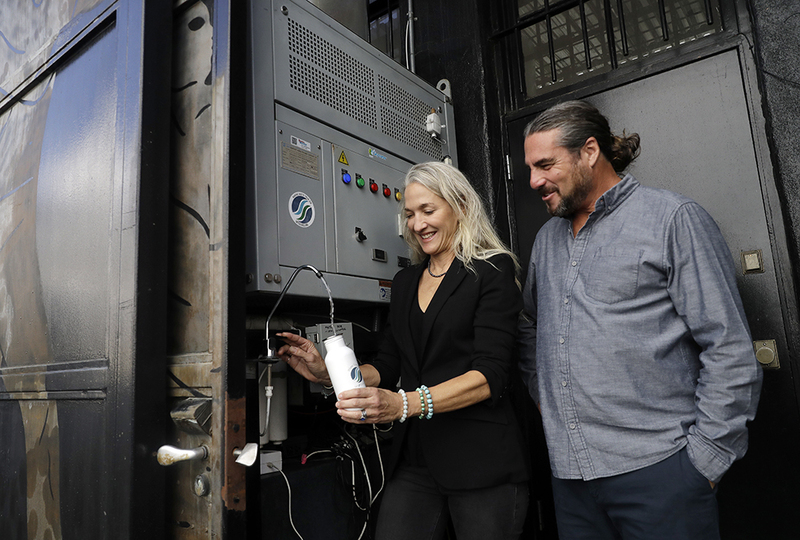 “Laura and I have committed to using it all…to get [water machines] to people who need the water most,” Hertz says. Mookkie is one smart feed bowl. Is there a solution to daily shots for diabetics? Doctors measure vital signs to get a view of overall health. If a robot can vacuum a room, why can’t it mow a lawn? It's so cool that they can capture water from thin air. There are so many countries that need that kind of technology. This very cool and helpful to other poor countries. in my opinion, Its a better idea to get water to people than the one where you try to get a giant iceburg somewhere. It's so cool taking water out of thin air, so amazing!! Aren't the polar icecaps melting already? Why speed it up? You would melt the ice burgs faster. That's amazing!!! Wish I was that smart! Lol! Sorry you guys, but they have a much smaller, more portable way of doing this. Just look up Fontus on the internet. Go to the Fontus website and read up on it. It is a self-filling water bottle that uses the moisture from the air, filters it and fills up your water bottle. Technology is improving every day as we speak. It's so cool bc the technology is pretty simple but it's still extremely effective. I wish I'd known about this a few days ago so I could have mentioned something about these in a big STEM competition I just participated in. I can't believe how much water they generate! Also that trophy was awesome. I wonder who the other top 5 were? I didn't know that somebody created their own space ship! thats so great! im glad that they are doing this!! it will help so many people in need, and water form thin air is crazy!!! !this is amazing. i hope we will have one of these someday! I am so glad they will be helping people that don't have water like people in Africa! THE MOISTURE VAPORATOR EXISTS BABY!!! THIS IS GREAT! To everyone who thinks I am a crazy whacked out kid: they had these is Star Wars. If you will all remember the Lars family (Luke Skywalkers' grandma's side of the fam) were MOISTURE FARMERS. They used devices like this on Tatooine. This is amazing! Also, the water bottle thing is great too. Especially if you get stranded in the woods/desert/wherever and have no access to water. The XPrize people/inventors are awesome. Oh my gosh this is so cool! I’m blown away by this discovery!! And how simple it is too!!! This will help so many people and will drown thirst in many places!! I hope this keeps going until it is a world wide way to get water. Oh My Gosh Your Right! Moisture Farmers exist now! YOU"RE RIGHT! I wonder what stuff from STAR WARS we'll get next. The thing is.... there is no water in the air where I live. The air here is dryer than dry. Also, is this machine just one big dehumidifier? Pie in the Sky After you've read all of the stories in the March/April Pie in the Sky section, take the quiz and test your knowledge.